Women/Girls White 100% Leather Clogging / Tap Shoes. Shoes come with standard tap plates installed - as photo shows. Our shoes come with standard tap plates, ready for dancing ! Stevens Stompers Clogging Tap plates also available - please see our other listing. 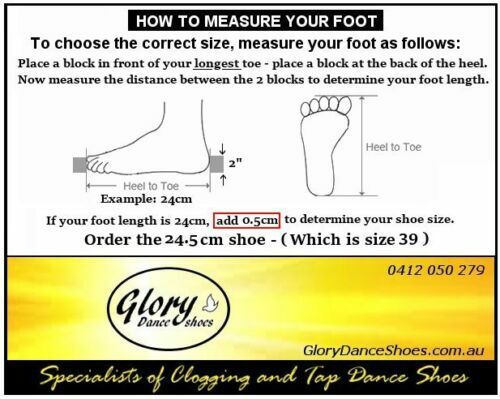 You are buying from Glory Dance Shoes Australia and stock is available for immediate despatch. "It was such a pleasure to deal from a company of dancers who know what dancers want. They're so stylish and the quality is second-to-none. The shoes are so comfortable. No blisters or sore feet at all even after a 3-day dancing camp, I'm one very happy camper." Click the button below to add the Ladies / Children Lace-up Clogging Tap Dance Shoes to your wish list.